While you can add URLs to the Dock from every web browser, we’re going to focus on Safari here. This works in all versions of Mac OS X, so it should not matter what version of system software the Mac is running. Now when you click on that shortcut from the Mac Dock, you’ll instantly open Safari and a new browser window to that website. 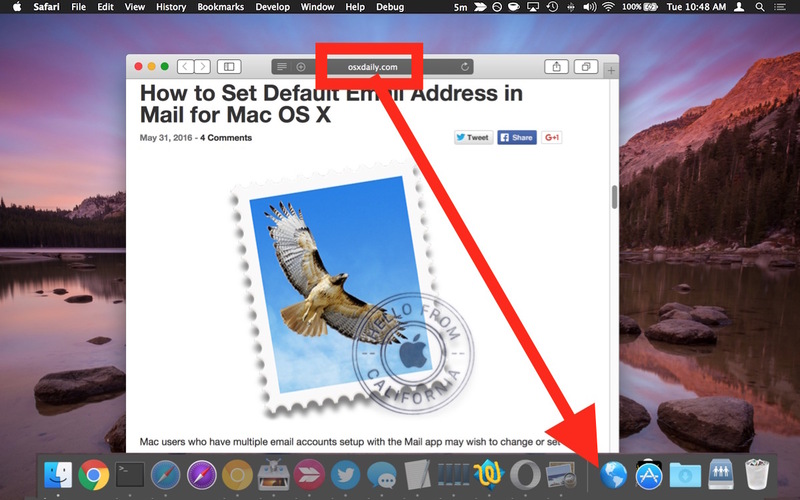 You can repeat this trick to add multiple websites to the Dock for quick access if desired. If you’re having trouble with clicking and dragging the URL, you can also grab the websites bookmark icon and drag that into the Dock as well (which is how this trick works in some of the other web browsers as well, so if you’re using something other than Safari try that approach). Another helpful tip if you’re having difficulty getting this to work as intended, is to be sure to drag the URL to the right side of the Dock, not the left side. There is a faint divider which separates the two, and only the right-side can accept files, folders, and URL links. The left side of the Dock is for apps only. This approach offers a quick and easy way to access a frequently visited website from anywhere on the Mac, similar to adding website bookmarks to the iOS home screen. Of course you can always just add bookmarks into Safari, Chrome, Opera, or Firefox as well, but those require you to be within the app to have access to their bookmarks, whereas this approach will open the browser and the website directly. This probably goes without saying, but if you click the new Dock icon when the web browser is closed or quit, the web browser will launch again and load the URL that was bookmarked into the Dock. So if you created the bookmark in Safari, then Safari will open – that bookmark association persists even if your default web browser changes – so that is something to keep in mind. Does not work for me using a two-year old MB Pro running El Capitan 10.11.5. I first have to drag that URL to the desktop, then drag and drop the resulting icon onto the Dock. Multiple tries to move the URL directly to the Dock failed. It works for everyone, it’s a feature of Safari to drag the URL. The Dock can hold anything you drag into it. The specs don’t matter, it is a feature on the Mac OS. If you can drag it to the desktop you can drag it to the Dock. Drag it to the right side of the Dock only. 2014 27″ SSD iMac. 10.11.5 Doesn’t work. bruce: I think I have that same identical Mac. works here. Are you sure you’re dragging the URL to the correct section of the Dock. There are two sections: one for Apps, and the other for Files and Folders. Drag it to that section. Drag the URL to the desktop. Then Right click on it and choose “Get Info”. You can then copy and paste any icon to the icon shown in the upper left side of the URL “get info” dialog box. Then move it to the dock. I’ve made a folder in the documents folder called Links (or whatever you like) and put subfolders with different titles in that Links folder. Then drag any url you encounter into the desired subfolder. Drag the Links folder into the Doc and you’re good to go for pretty much infinite links. It opens Safari when you click on any link. That’s a good tip, I like that idea for the dock folder of LInks. good Idea. Depending on what version of OS X you’ll get a different icon, mines an @ on a spring, It would be helpful if the icon reflected the websites bookmark icon otherwise we are going to have a handful of identical icons to choose from. To be honest if you’re only going to have one site that you go to first then just make that the safari home page, and other very frequently used sites in the favourites bar. If people like this feature, try fluid app (fluidapp.com). I’m a big fan and it’s free, with upgradable features. I liked it better when doing this created an “@” sign on a spring. The icon of the world may make more sense as in “world wide web”, but the @ sign on a spring was just cool! This doesn’t work for me. Anyone know if they’ve removed this feature since 2016?? For those using Safari, why crowd the Dock, instead of using Safari’s Favourite bar, on which I have listed 29 websites that I use almost daily. To fit them all in I rename them. For the Stockmarket I substitute $, my bank €, this site OSX etc.. I have Safari in the Dock, but I usually launch it by pressing a button on my Logitech MX Anywhere 2 mouse. I prefer this system as it’s very fast, and particularly convenient when Safari is already open.